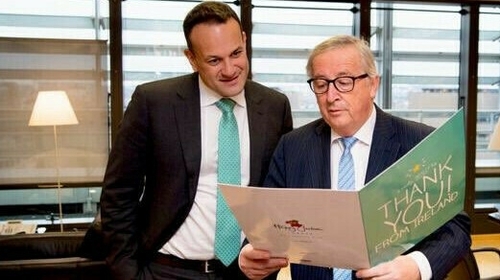 An Irish woman who sent a 'Thank You' card to Jean-Claude Juncker has said she was inspired to send it after the President of the European Commission stood up for Ireland. Images of the large green card emerged during Taoiseach Leo Varadkar's visit to Brussels yesterday. The card says "Thank you from Ireland" on the front, and inside contains a message saying "for the first time ever Ireland is stronger than Britain". Speaking on RTÉ's Liveline, Haley Kierse said she was quite worried when she had heard British politicans saying they wished to renegotiate the Withdrawal Agreement. However, her concerns were eased when Mr Juncker told the European Parliament that "Ireland's borders are Europe's borders". According to the card, she wanted to jump for joy, punch the air and kiss Mr Juncker when she heard that statement. "I knew at that point that we had the support of the Europe and nothing was going to change," she told Liveline. While people initially thought Mr Varadkar had given the card to Mr Juncker, it emerged that it was sent by Ms Kierse via an online card retailer and she says he only got it about two days ago. Ms Kierse said she is not into politics and has no agenda. She said she first found out he had got the card when she saw it on television while doing the ironing last night. She also revealed that the last two names included on the card - Scooby and Little Boo - are her pet dogs, a Chihuaha and a Jack Russell. Ms Kierse claims she was speaking from her heart when she wrote the message for the card. "The EU was formed because of World War II," she said. "Not having world wars is something very important and Britain is choosing not to be a part of that."